ALIEN REACTION FIGURE PREORDERS OPEN NOW! PREORDERS OPEN NOW — THE FIGURES WILL BEGIN SHIPPING IN LATE OCTOBER. In 1979, prototypes for 3 ¾” action figures for the ALIEN film were developed but never manufactured. Through our network of industry and collector contacts, Super7 has unearthed reference material and original 34-year-old prototypes and will now make these “lost toys” a reality. 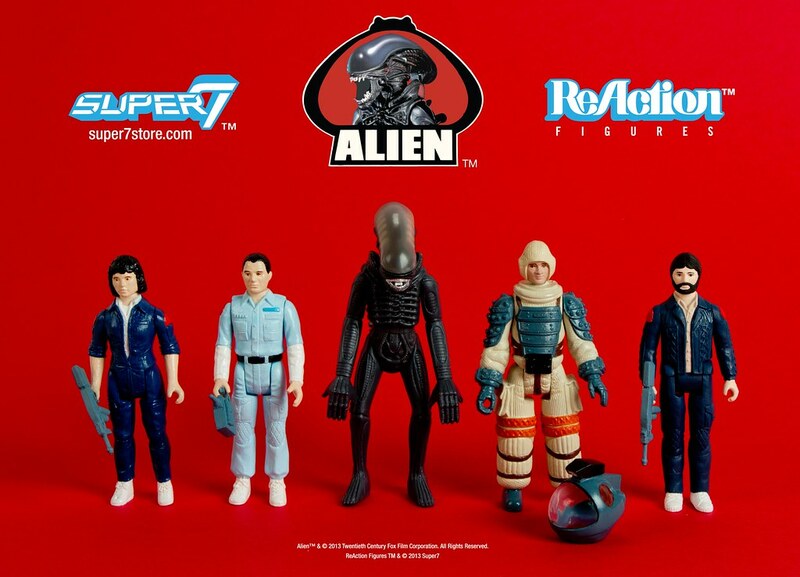 Under authorization from 20th Century Fox, Super7 will produce the full series of ALIEN toys as part of our ReAction Figure Series (Retro-Action). Each is stylized exactly as items from the “golden age” of action figures with approximately five points of articulation, accessories, and period-authentic blister card packaging. * THE ALIEN (“BIG CHAP”) – w/ removable transparent dome, extendable jaws and glow-in-the-dark head! $100.00 set of 5 figures. Each figure is packaged individually on a blister card. When preordering the ALIEN merchandise, please select PREORDER for your shipping option. We will send a separate shipping invoice when the goods are ready to ship in the fall. PREORDERS OPEN NOW — THE GLASSES WILL BEGIN SHIPPING IN LATE OCTOBER. 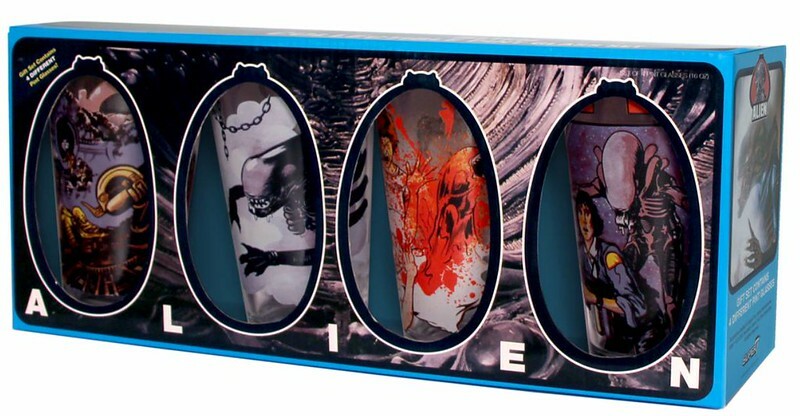 These four glasses present a memorable scene from the movie on the front side, featuring colorful artwork created exclusively for this Gift Set. The backs reveal the four-part lifecycle of the Xenomorph – the menacing ALIEN creature itself. Each 16 ounce Pint Glass measures approximately 5 ¾” tall. 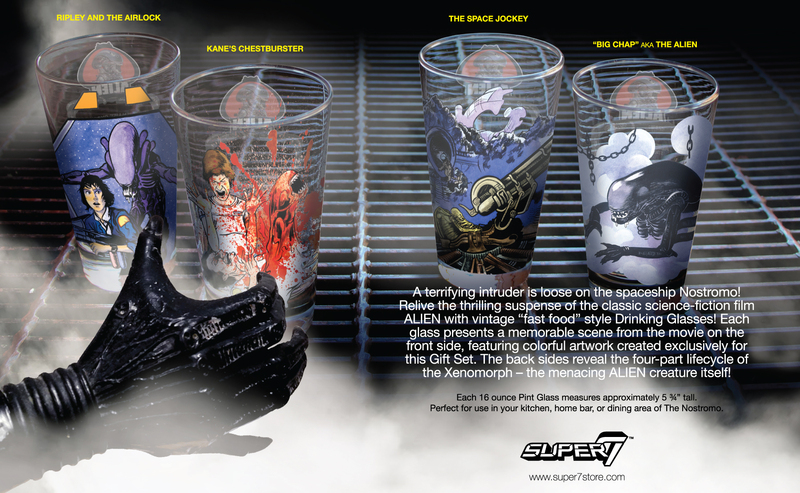 Perfect for use in your kitchen, home bar, or dining area of The Nostromo. $49.99 set of 4 glasses in a boxed set. ALIEN GLASS “APPROVED” BY VERONICA CARTWRIGHT! FINAL DAY FOR ALIEN REACTION FIGURE PREORDERS!